This is an arial shot of the location of the camp in Upper Michigan that inspired the setting of The Gateway Chronicles. To protect the identity of the camp, I put a white box over the camp name in the lower left corner. Alitheians your worst disobedience is at hand. The Shadow of whom no man has yet spoke. And Pateros will leave Alitheia to peril. For out of another world will help come. To right what went wrong and with courage defend. Companion, Scribe, Musician, Spy, Warrior, Intended. Great friend of the Scribe, who will write words of wealth. Making steps for the Spy, who will seek despite cost. Penetrating shadow, rending bone from sinew. For your abilities men have sought, and always will seek. Marked by a ring and the deepest color: red. To vanquish the Shadow, Alitheia to mend. With unraveled image, journey begins. In error undone, destiny wins. Pen of the Scribe shows the way. Kill not the Intended until this is done. Beware, beware, beware the white thread. You, the Intended, have much truth to seek. Your path is not for the fainthearted or weak. Recovered, translated, against which you’ll fight. Their meanings should have been interpreted better. Ask yourself, Lady, who is the king? And what is the ring that will mark you, in sooth? In answering you’ll find your way to the truth. The words of the prophecy you now have at hand. With the deepest color defining you. You have one sacrifice to make. Whose blood is yours to take. Chrysopoeia, of the sacrifice taken. 1) When is Darcy's birthday? 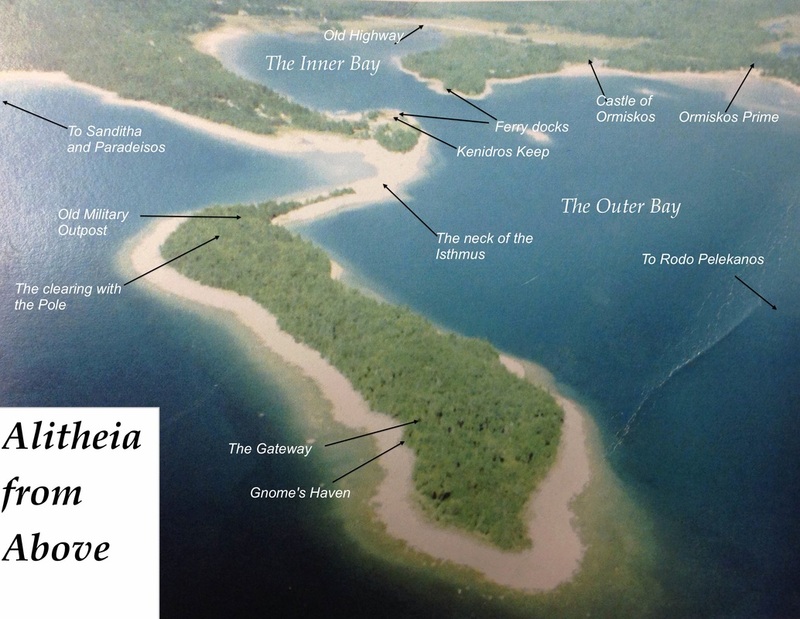 2) True or False: The setting of The Gateway Chronicles is based off a real-life camp. ​3) After whom did Yahto Veli name his son? 4) How many Nark bodyguards does each Alitheian royal get? 5) What is the name of the island that is visible in the Outer Bay of Ormiskos? 6) Tellius's parents were murdered during what season? 7) What was Tselloch told to "beware"? 8) With whom does Lewis exchange a dream while in the archipelago? 9) From what bird does Lewis's quill come? 10) Who is MY favorite character in The Gateway Chronicles? ​11) What elements can Rubidius control? ​12) From what language did I take most of the Alitheian names? 13) How many of the Six are named after some of my favorite authors or literary characters? 14) Whose parents have I never formerly introduced? 15) How old was Eleanor when she came to Alitheia? 17) In what cooking substance does Darcy's mom cook French Toast? 18) According to camp rumor, what had Colin done to the rec center at camp? 19) How old is Darcy at the beginning of book 6? ​20) Which Alitheian character has a name that means "Young Bear"? 21) What is on the Alitheian flag? 22) Who saved Tellius and Cadmus when their parents were murdered? 23) What is the name of Tellius's horse? 24) When was The Six first published? 25) Where did Darcy's dad go to college? 26) Who is the oldest member of The Six? ​27) What is the name of the redhead who has a crush on Amelia in Alitheia? 28) When is Tellius's birthday? 29) What is Amelia's enchanted object? 30) What flowers do Alitheians plant on the graves of their dead? 31) What type of elemental magic does Darcy have? 32) Out of what city is my publisher, TWCS, based? Congratulations! You are a true fangirl/fanboy! Pat yourself on the back! Not bad . . . not bad at all. Long distance high five for you! Hmmm . . . not terrible, but not great either. Don't worry, it happens to the best of us! Perhaps it's time to revisit the series. ​Oh dear. Do you have a tummy ache? A headache? I applaud your effort, but it clearly wasn't your day. Better luck next time! GAME #2: Could YOU survive in Alitheia? Click on the link below to go to a quiz that will allow you to find out! Check out my Quiz at MakeAQuiz.net! 13-15 Correct - Congratulations! Should you ever find your way through a gateway to Alitheia, you should survive just fine. 10-13 Correct - Dicey. You might want to prepare a little more before you go. 0-10 Correct - I would advise against magical travels for you. You would probably perish in Alitheia.